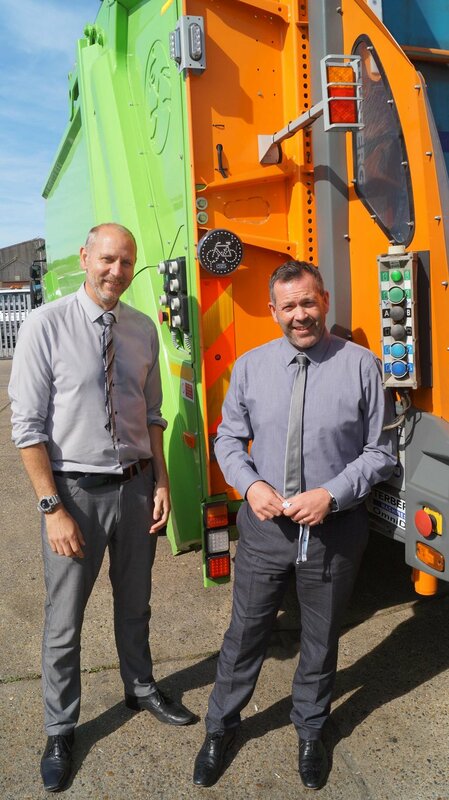 Since introducing a four-day working week and longer hours each day for the shared waste collection service, Suffolk Coastal Services and Waveney Norse have equipped their new Refuse Collection Vehicles with the Cyclear™ Cyclist Warning Display System. The move is to ensure that vehicles meet the highest safety standards whilst undertaking longer rounds. Suffolk Coastal Norse and Waveney Norse is a joint venture partnership set up by Norse Commercial Services to increase efficiency, resource optimisation and financial savings for both Councils. Currently Cyclear™ is in operation on 5 vehicles operating across Lowestoft, Halesworth, Felixstowe, Woodbridge and surrounding areas including new housing developments. The plan is to include the system as part of the standard specification for all new waste and recycling vehicles in the future. The vehicles are also equipped with ISS reversing radar and ‘Caution Workers At Rear’ light-boards.